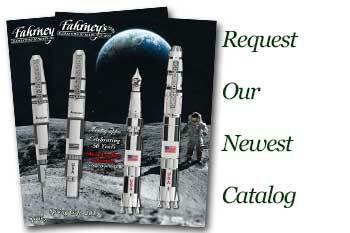 Order your Namiki Nippon Art Origami Fountain Pen today from FahrneysPens.com. Fine Pens, Refills & Luxurious Gifts – great prices & fast shipping. The newest Nippon Art collection features Origami, the traditional Japanese art of paper folding. Practiced since the Edo period (1603-1867), the goal of this art form is to create representations of objects using geometric folds and crease patterns on a single piece of paper. Namiki brings this magical collection to life in Hira-maki-e, a technique involving metallic and colored powders hand-applied onto the rich black resin barrels. The result is an intriguing blend of artisanal skills and playful motifs! The Crane, one of the most familiar origami shapes, is shown flying through the cloud-filled sky. Two Rabbits silently gaze at the full moon at night. The Goldfish, an auspicious symbol of good fortune since ancient times, are swimming under water as currents and bubbles swirl about. The Penguin depicts a baby penguin with its parent in a wintry world of snow with the aurora borealis in the background. The Kabuto, or Samurai helmet, is a well-known origami shape featuring a background set in spring with pinwheels blowing in the breeze. 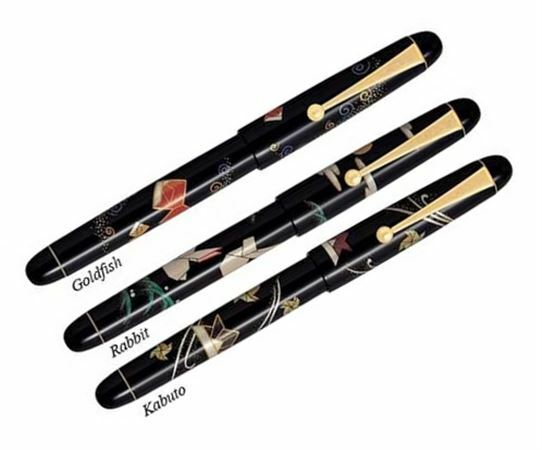 The Nippon Art fountain pens offer a beautiful 14K gold nib and signature Namiki clip. Let the art of Origami enliven your words every time you write! Uses cartridges or converter.